Jonathon Cook is currently an advanced skills teacher at Austins Ferry Primary School in Hobart, Tasmania, Australia. Apart from being a 5/6 teacher, he is also in charge of transition, career focused learning and STEM at the school. He’s in the early part of his career having been teacher for 10 years, with experience teaching in the Kimberly region, rural parts of Tasmania and in Hobart. Passionate about bringing equity to all kids in the state, we discuss what it takes to lift engagement in schools. Chonny is the Director of Wellbeing at Presbyterian Ladies' College in Perth, Western Australia. In her role, Chonny has been charged with leading the work of the groundbreaking PLC Lighthouse, a $10.5 million health and wellness center for students from pre-kindergarten to Year 12. The Lighthouse is made up of three floors, each with a distinct purpose and focus and seeks to fully embed personalised wellbeing and positive education into the core work of the school. Professor Adrian Piccoli was the NSW Minister for Education between 2011 and 2017. During these six years, he led significant education reform in NSW and nationally. His advocacy for quality teaching, needs-based funding for schools and improving the performance of rural and remote students see him regarded as one of the best education ministers in Australia. He holds degrees in economics and law and is now the director of the Gonski Institute for Education at UNSW, and Professor in the School of Education. Samaira Mehta is a 10 year old entrepreneur from California in the US. At the age of 7, Samaira invented a coding board game which she has taught over 2000 children to play so far. Samaira has started an initiative to teach coding to underrepresented girls called ‘Girls U Code’, and to recognise her important work has received letters from The White House. She is passionate about helping everyone to be excited about coding, programming and STEM, and through her work she helps to bridge the gender gap in technology. Iain Taylor is the principal of Manurewa Intermediate, a middle school with 850 students outside of Auckland, New Zealand. 45% of students identify as Pasifika and 35% as Maori and today we unpack exactly what Iain and his leadership team did to transform Manurewa Intermediate into one of the best intermediate schools in the country, winning the Prime Minister’s Education Excellence Supreme Award in 2017. Iain is also joining us on the EC18 stage on 2nd October in Melbourne. Dr. Lindsa McIntyre is currently the inspiring headmaster of the Jeremiah E. Burke High School, located in the heart of the “promise neighborhood” of Boston. As a school leader, she has helped transform the Burke into a positive learning environment of love, becoming the first high school in Massachusetts to exit Turnaround status. In 2011 she was honoured by the Freedom House as a Champion of Freedom. She will be delivering one of the keynote for our EC18 conference in Melbourne on October 2nd. Jim Watterston is currently the Dean of the Graduate School of Education at the University of Melbourne. He began this role in January after many successful years leading education systems around Australia, including most recently in the role of Director-General of the Queensland Department of Education and Training. He has also led education as Director General of the ACT and as a Deputy Secretary in Victoria. We discuss leadership, teacher training and the need to reconceptualise education. Alice was a passionate head of department in a Melbourne school before she shared her love for food and education as a contestant on Season Four of Masterchef. Since then, there has been a children’s cook book, children’s TV series, regular radio appearances and a stint as food editor for The Weekly Review. Alice discusses her insights as an educator on food as well as her new project, Phenonenom, a curriculum-aligned digital food education resource for primary teachers. Larry Rosenstock is President, CEO and Founding Principal of High Tech High, a network of thirteen incredible public charter schools K-12 in California. With a remarkable career in education receiving the Ford Foundation Innovations Award, an Ashoka Fellowship, and the McGraw Prize in Education, he has also served as an attorney at the Harvard Center for Law and Education and as a visiting professor at UC Berkley. We explore the philosophy of HTH that has lead to quality learning and outcomes for students. Beverley Oliver is the Alfred Deakin Professor and Deputy Vice-Chancellor at Deakin University. A leader in innovative student learning and experience in the higher education sector, she leads the university's drive to premium digital education and is an expert on graduate employability, skills and capabilities, digital credentialing, curriculum reform and digital innovation. We discuss the fascinating and evolving field of higher education and the knowledge and skills we need for this changing world. Cally is a Deputy Principal at Bundaberg State High School up in Queensland, Australia, and the EC team were lucky enough to meet her in 2016 when Cally took part in the Changemaker Program. Cally is an incredibly passionate educator who is particularly focussed on changing the game for kids who are disengaged and sometimes school refusing, and is all about helping them to reengage with the education system. Max Stossel is the Head of Content & Storytelling for the Center for Humane Technology, an organization of former tech insiders and CEOs dedicated to realigning technology with humanity's best interests. Before joining CHT, Max was a media strategist, spending more time learning the ins and outs of the facebook algorithm than any human should. He is also an award winning poet and filmmaker and his work has spanned across 14 languages, won two Webby Awards and consistently gets millions of views. Today we chat about the implications of technology for our modern world and the learners in our classrooms. With a successful career in industry behind him, Dave is now a Year 9-13 Metal Technology teacher in Whakatane, NZ, at Trident High School. In 2016, he was one of 6 teachers across NZ to be presented with a National Excellence in Teaching award by the Minister for Education. Dave is passionate about sustainability and empowering young people, and he leads brilliant learning with his senior metal technology students who co-design and build solutions for powering the school with renewable energy sources. Briony Scott is the principal of Wenona College, an independent girls school in North Sydney, Australia. A brilliant thinker and educational leader, Briony has run a number of schools and teams over her distinguished career. She hold a Bachelor of Science in Agriculture, a Master of Education and a Doctor of Education, with expertise on girls' education, the utilisation of educational technology, and non-government school funding policy. Briony is a contributor to a range of publications. Nicole Dyson has lead whole school curriculum change at some of Queensland’s top performing public schools. Passionate about project based learning and student entrepreneurship, she is the founder of Mayd, a curriculum aligned education program for high school students and a co-founder of Future Anything. She also contributes to the Foundation for Young Australians YLab program. Nic now also leads our Future Ready Program at EC, providing teachers with support to deepen engagement and learning. Lasse is Head of Operations and Partner at HundrED.org. HundrED seeks and shares 100 inspiring innovations in K-12 education worldwide every year through a supportive community. Lasse has worked in education and career-planning since 2003 and beyond his work with HundrED, he has been building Mentors of Finland, a non-profit organisation that mentors unemployed young people to find a job, free-of-charge, that now reaches 100,000 students monthly. Professor Frank Oberklaid is an internationally recognised researcher, author, lecturer and paediatrician and speaks to us today on the importance of development and learning in the early years of life. He is the Foundation Director of the Centre for Community Child Health at The Royal Children’s Hospital – Melbourne, an Honorary Professor of Paediatrics at the University of Melbourne, and continues to advise Governments on how communities can provide the best start to life for children. Welcome back to Season 2! Today we talk with Kaila Colbin. She is the ANZ ambassador for Singularity University, a movement that seeks to use the power of technology to transform society in positive ways. A serial entrepreneur based in Christchurch, she is also the Curator and Licensee for TEDxChristchurch and TEDxScottBase in Antarctica. In this future focused interview, we discuss the implications of exponential technologies on society, and what this means for students, teachers and schools. 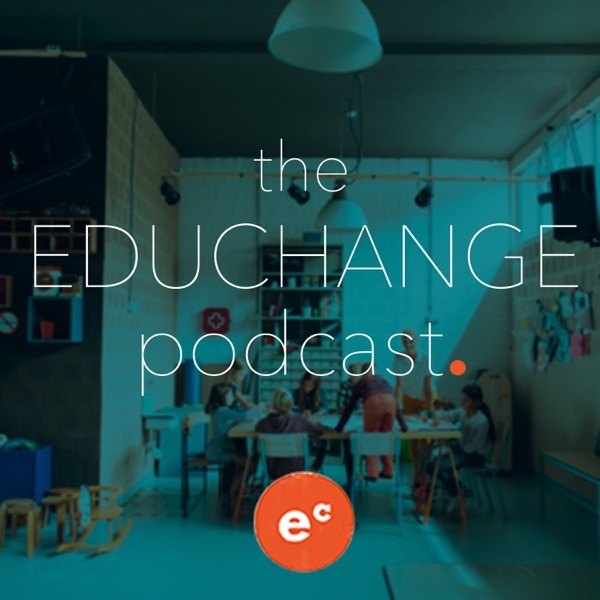 Thanks for listening along to the Educhange Podcast this year. We've loved hearing the stories of change from innovators and educators from all across the globe. We're taking a break until mid January but have some brilliant people lined up to share their insights. Have a happy New Year and see you in 2018!